Blondies are basically brownies without the chocolate, causing them to be golden and light but still lovingly rich and buttery. 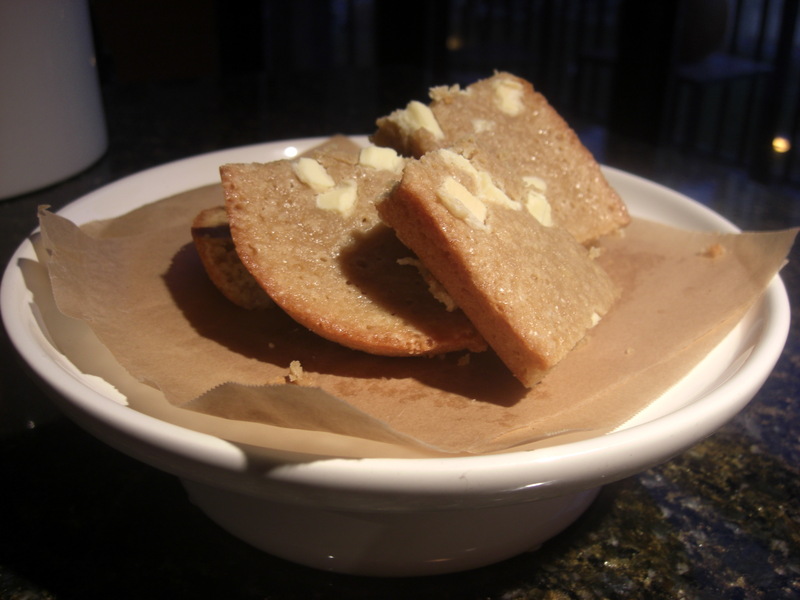 These blondies are not stupid (please note I am kidding because I used to be blonde and I know for a fact the perception isn’t true) – if anything they are a smart cookie taking minimal prep and having lots of flavor. They are bursting with potential. I added white chocolate chunks, but you can really add any candy you love. Add crushed candy canes for a holiday blondie! While many people have a thing for chocolate, I am indifferent towards it (I can hear you all gasping). Really, seriously, I prefer vanilla and fruit flavors to anything chocolatey decadent. Crazy, I know. I think its genetic because my father is the same way. I will say that lately I’ve had a thing for white chocolate which I guess isn’t actually chocolate at all (according to the FDA). It doesn’t contain chocolate liqueur which is the requirement of true chocolate. It contains cocoa butter, which gives it the flavor and allows it to have the name chocolate. 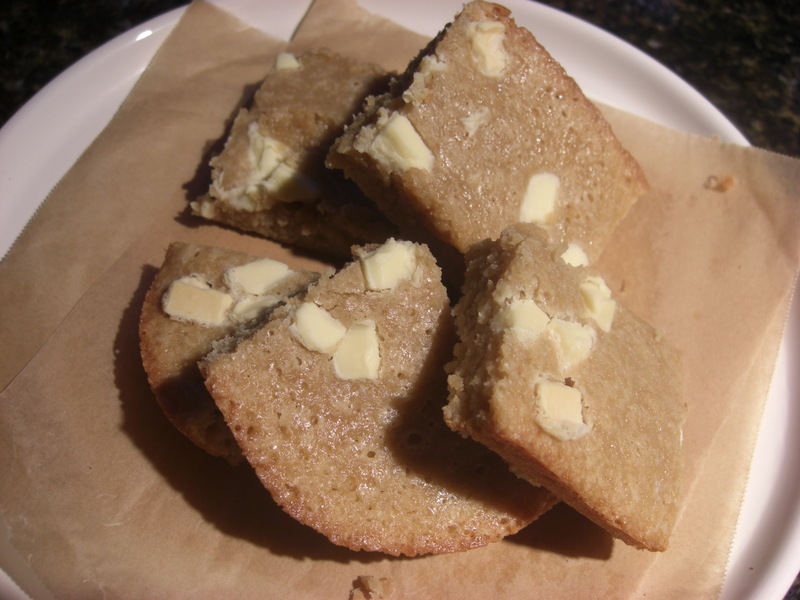 I highly recommend white chocolate in this recipe because it makes a great vanilla pairing. Preheat oven to 350 degrees. Spray an 8 by 8 inch baking pan or glass pan with non-stick spray. Line pan with parchment paper, and spray paper as well. You will thank yourself later for taking the time to spray both. In a large bowl, whisk together butter and sugars until smooth. Whisk in eggs and vanilla. Add flour and salt and stir until just moistened. Add 1/2 off white chocolate chips and stir just to evenly distribute. Transfer batter to prepared pan and smooth top (or gently tap pan against counter). Top with the rest of the white chocolate chunks. Bake until top of cake is golden brown and a toothpick inserted in center comes out clean, about 35-45 minutes. Set pan on a wire rack and let cool completely. 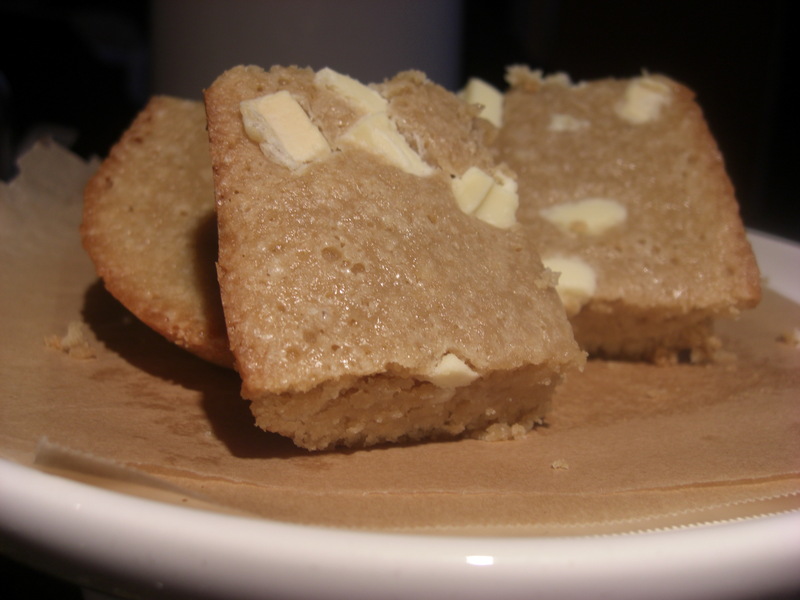 Use the parchement overhang to life the blondies out and cut into even squares. Makes about 8, depending on how you like to size your blondies. Can be stored in a sealed container at room temperature for up to 3 days.